The Yemeni government has sent a letter to the UN asking “to quickly intervene by land forces to save” the nation. The contested cities of Aden and Taiz are of particular concern to anti-Houthi forces, according to the letter seen by Reuters. Yemen’s UN envoy Khaled Alyemany reportedly sent the letter on Wednesday. Such a move could provide a legal ground for putting foreign boots on the ground in the war-torn country. Addressed to the UN Security Council, the letter also asks human rights groups to record “barbaric violations against a defenseless population” and blames the Houthi Shiite rebels for the death of civilians. A similar document, informing the Security Council that Yemen requested military help from the Gulf Arab states, was sent to the UN just a day before a Saudi Arabia-led coalition launched air strikes against the Houthi forces on March 24. Despite the end of the first phase of the Saudi-led campaign, codenamed “Decisive Storm,” on April 21, the fighting continues to rage on in Yemen. The second phase has been named operation “Restoring Hope,” which was said to be focused on diplomacy, but did not rule out new airstrikes. At least 120 people died in Yemen’s violence on Wednesday, the majority of them civilians, according to Reuters. At least 40 of those died while attempting to flee the southern port city of Aden by boat. One report claims the vessel was struck by Houthi shells. Another report suggested that a barrage of coalition airstrikes was responsible for the death of at least 21 civilians in the north-western province of Saada. The province, which borders Saudi Arabia, is known as a Houthi stronghold. The majority of the fighting is currently concentrated in Aden’s Tawahi district, where Houthi forces were making advances. Overall, nearly 1,250 people have been killed, and at least 5,044 others injured between March 19 and April 27, according to the World Health Organization. However, local estimates are much higher. Back in September 2014, Houthi rebels took control of the capital Sanaa ousting Sunni President Abd-Rabbu Mansour Hadi, who fled to Saudi Arabia. 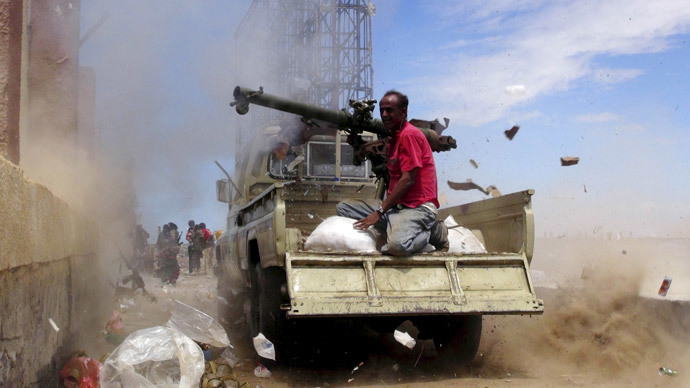 They are now fighting for control of Aden, which is home to about 800,000 people.